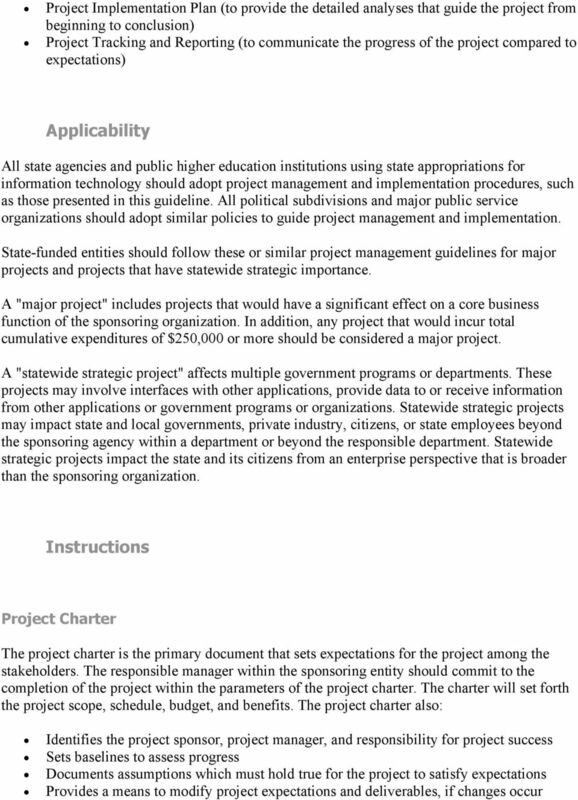 3 The contents of the project charter should include: Project Description. 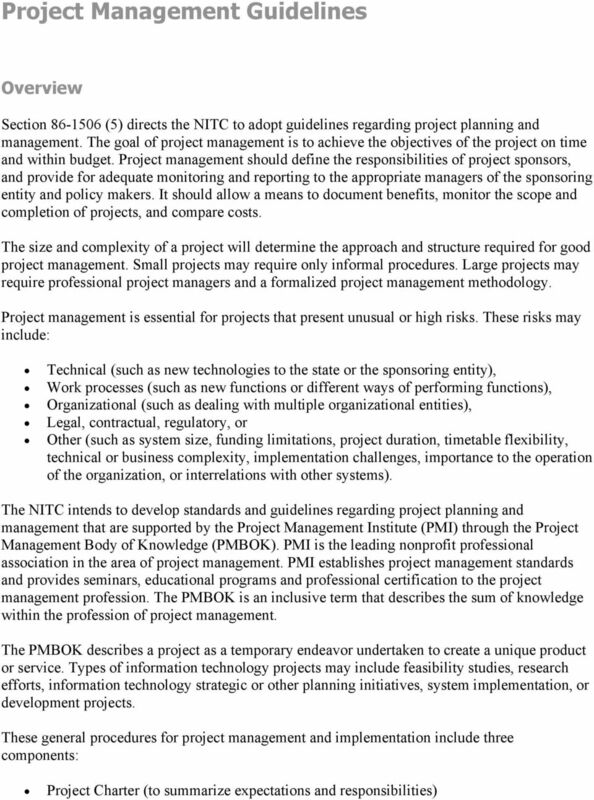 Include a brief description of the purpose of the project in non-technical terms. Project Scope and Objectives. Include one or two paragraphs defining the project scope and objectives in terms of the specific business functions the project will support. 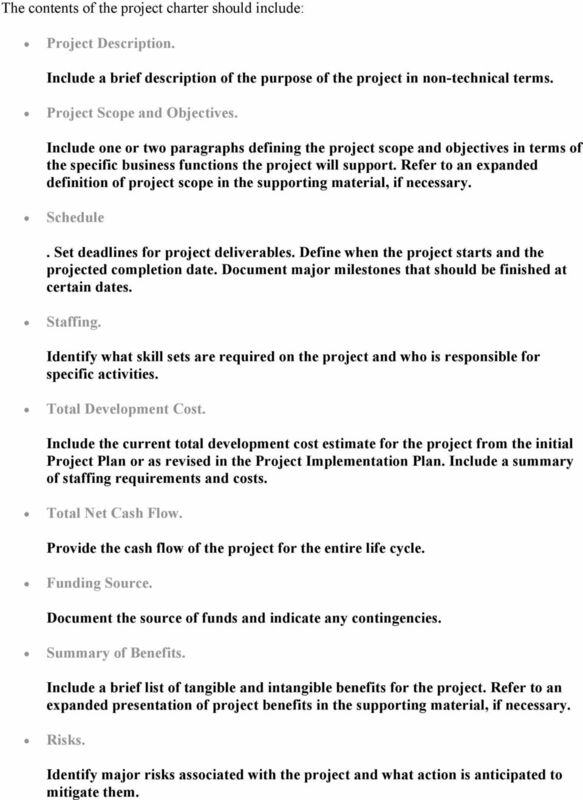 Refer to an expanded definition of project scope in the supporting material, if necessary. Schedule. Set deadlines for project deliverables. Define when the project starts and the projected completion date. Document major milestones that should be finished at certain dates. Staffing. Identify what skill sets are required on the project and who is responsible for specific activities. Total Development Cost. Include the current total development cost estimate for the project from the initial Project Plan or as revised in the Project Implementation Plan. Include a summary of staffing requirements and costs. Total Net Cash Flow. Provide the cash flow of the project for the entire life cycle. Funding Source. Document the source of funds and indicate any contingencies. Summary of Benefits. Include a brief list of tangible and intangible benefits for the project. Refer to an expanded presentation of project benefits in the supporting material, if necessary. Risks. Identify major risks associated with the project and what action is anticipated to mitigate them. 5 accomplishments and results against documented estimates contained in the implementation plan, and adjusting these estimates based on the actual accomplishments and results. Project tracking and reporting should serve the needs of: Project management Project sponsors Agency directors Policy makers Close attention to basic control principles will improve the success of projects. Achieving this requires a disciplined approach to tracking project status, anticipating potential problems that may arise, and quick attention to resolve any problems. Project tracking and reporting should include the following minimum components, with a comparison between estimated and actual status for that time period. 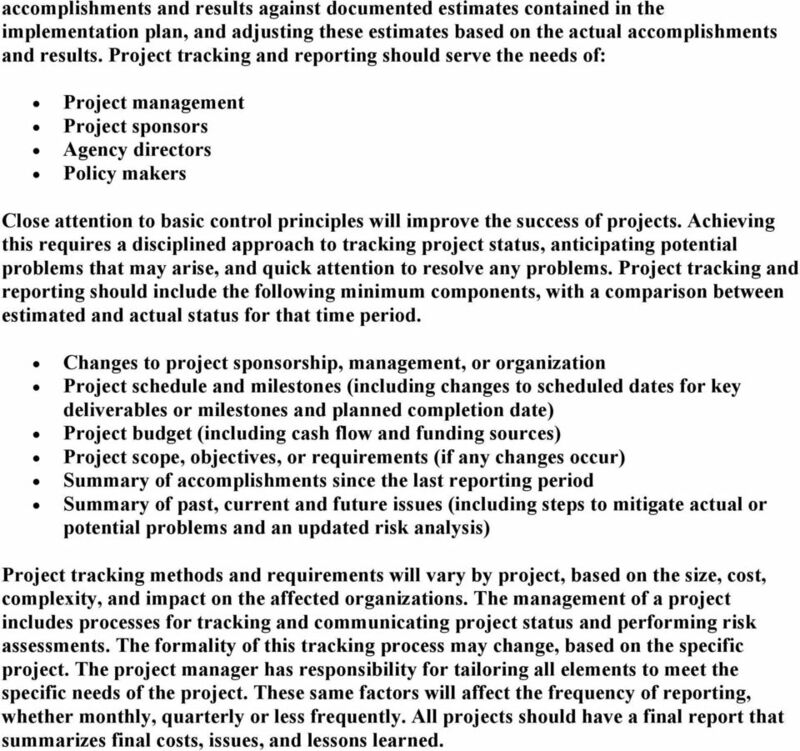 Changes to project sponsorship, management, or organization Project schedule and milestones (including changes to scheduled dates for key deliverables or milestones and planned completion date) Project budget (including cash flow and funding sources) Project scope, objectives, or requirements (if any changes occur) Summary of accomplishments since the last reporting period Summary of past, current and future issues (including steps to mitigate actual or potential problems and an updated risk analysis) Project tracking methods and requirements will vary by project, based on the size, cost, complexity, and impact on the affected organizations. 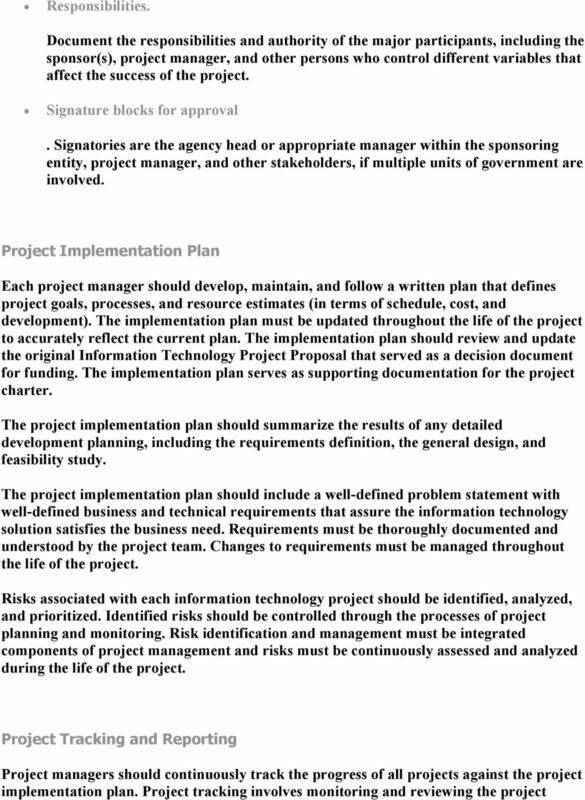 The management of a project includes processes for tracking and communicating project status and performing risk assessments. The formality of this tracking process may change, based on the specific project. The project manager has responsibility for tailoring all elements to meet the specific needs of the project. These same factors will affect the frequency of reporting, whether monthly, quarterly or less frequently. All projects should have a final report that summarizes final costs, issues, and lessons learned. TDWI strives to provide course books that are content-rich and that serve as useful reference documents after a class has ended. USFWC Project Management May 31 st, 2014 Project Management Basics Project Management Basics Project Definition Why do projects fail? Pain Curve Triple Constraint Principle Progressive Elaboration vs. The date the initiative has been given approval to proceed. This excludes any initiatives in start-up or concept stage.